The Dark Beneath the Ice was a complete surprise. It was surprisingly dark, eerie, and exactly what I needed in this cold winter season. To be creeped out in the best way. 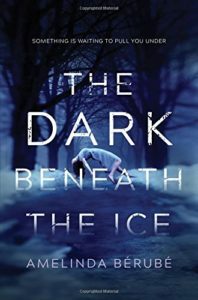 I love books like The Dark Beneath the Ice because if this was a movie, which would be an absolutely terrifying idea, I wouldn’t be able to watch it. Seriously. This is just the kind of movie that would totally keep me awake for nights to come. But as a book, I was able to enjoy the thrills, the terror, and the eerieness. And The Dark Beneath the Ice delivers majorly. All while also delivering me an adorable f/f romance that had me making cute noises admist my terror. AND a story about family, with its problems, secrets, and trying moments. The sapphic side plot was adorable. Like a freaking adorable. I don’t like my terror with no brief glimpses of light, or sweeteness. So this was the perfect addition to this chilling story. (And Marianne also questions her sexuality and the labels, so while this is a small moment in the grand story, it meant a lot to me). The chills, the eerieness, all of it. This was just my kind of supernatural fear that I am here for. And I am a terrible wimp. And this book still wrung four stars out of my terrified heart. Water is almost a character of its own. Not only are there gorgeous water metaphors, but the water almost becomes its own entity. Delightfully dark. The family is messy, flawed, and totally wonderful. There’s cracks, mistakes, and tons of relatability. Marianne’s parents are going through a divorce and it rips a whole in their family, in their home, and in her world. The Dark Beneath the Ice gets real about what happens when you feel like you have to support your parent. When you have to stay strong for them. I loved the mystery element of the story, how Marianne doesn’t remember what is happening, and as we begin to suspect her, she begins to disbelieve herself. Marianne has this totally relatable fear of being called out. Seen for who we think we are in the whispers of the night. Sure, the scale is completely different. But this very real tangible fear of hers felt like it was plucked from my very own nightmares. At at the very end, The Dark Beneath the Ice is also about what happens when you isolate yourself. The necessity of having a community, people who will support you, and believe you. Find The Dark Beneath the Ice on Goodreads, Amazon, Indiebound & The Book Depository. What is your favorite creepy movie or book? Would I, the biggest wimp, like it?